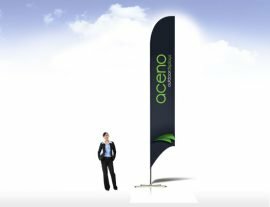 Tenji’s custom medium feather flags single sided are printed in full colour on one side while displaying a mirror reverse image on the opposite. 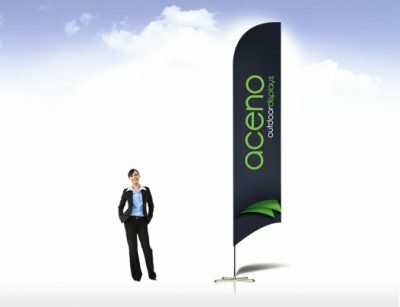 Advertising with feather flags are a very popular marketing tool for a variety of businesses. The various sizes and vibrant colours ensure you will stand out from surrounding competition with their attention grabbing movement. 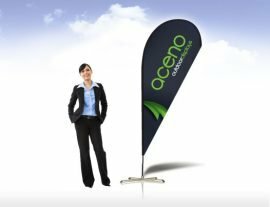 Feather flags are easily noticed from ongoing traffic getting your message out to endless new customers. The single sided feather flags are more transparent and cost effective. Remember we also have the option of double sided feather flags. Check out our website for more sizing and styling options. All Tenji’s flags are printed and sewn in house in our Brisbane factory ensuring Australian quality. For bulk quantities please email us.